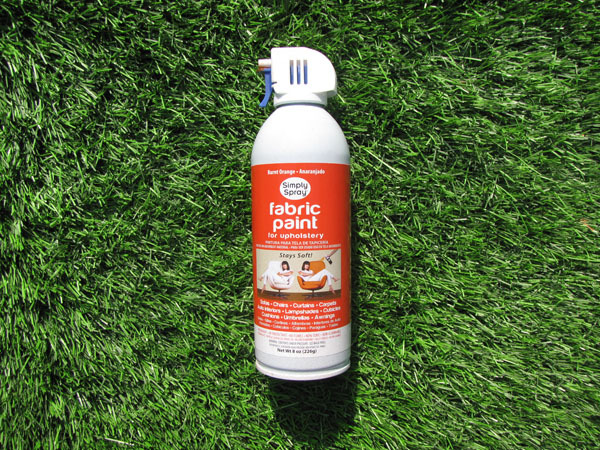 Tool Review: Couch Spray Paint. No, Seriously. Now picking up that ugly thing off the curb just got that much more attractive. 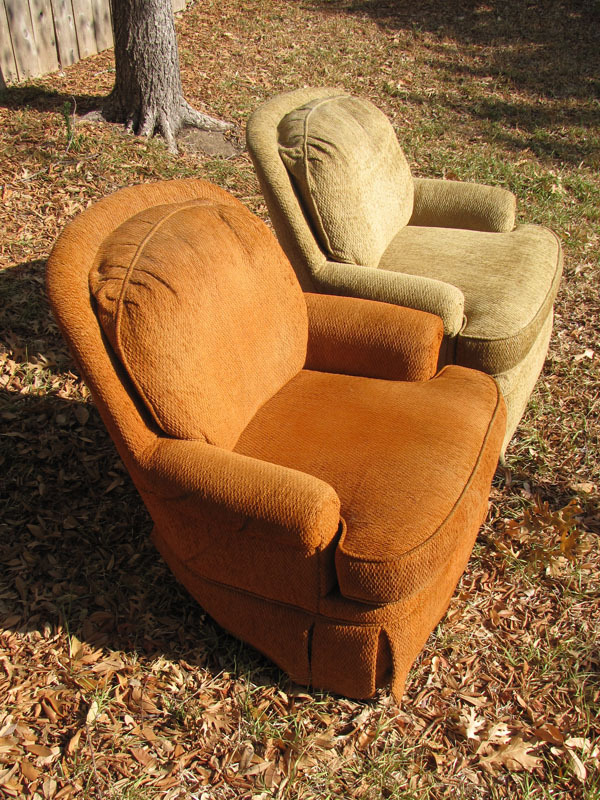 A few months back I stored some stuff for a between-jobs college buddy, and took two identical extremely comfy (but extremely ugly) armchairs as plunder when he eventually came and picked it up. He had no more room in the U-haul, and I found the chairs comfortable enough to ignore their ugliness. Most importantly, however, the cat freaking loved them. So they stayed. Anyway, I was enjoying their comfy-ness, and lamenting their ugliness, with a friend about a month ago. And after a couple of beers, apiece, she suggested spray-painting them. I was tipsy enough to consider that this might actually be a good idea, and if not that, then at least a sufficiently hare-brained idea to draw some decent traffic. A bit of drunken Googling later, we discovered that spray paint specifically designed for upholstery actually exists. The brand name is Simply Spray, and I bought mine through Amazon. That the color should be orange seemed inherently obvious, at the time. But I was committed, at that point, and to make an already-overlong story short, this stuff actually works pretty well. And considering what a ridiculous idea upholstery spray paint is, in the first place, it works almost astoundingly well. The starting color of your furniture makes a difference. 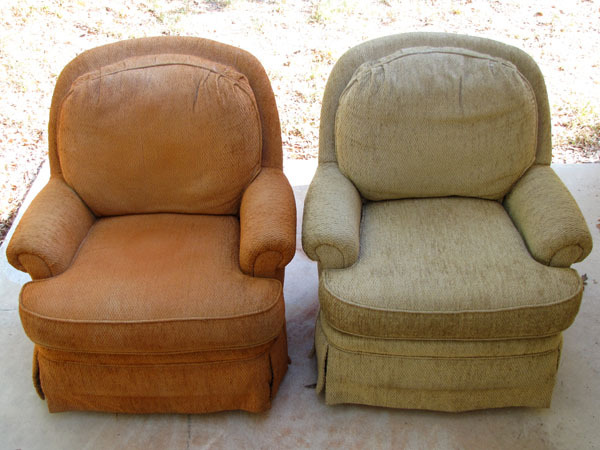 Over the dead-grass yellow of my plundered armchairs, orange went on extremely well. I was, in fact, so pleased by the resulting orange chair that I decided to try out the contrasting ?? ?periwinkle blue.??? Over the exact same fabric in the exact same color, however, the blue didn?? ?t cover nearly so well. In the bright sun, hints of the underlying fabric are still visible here and there, although under interior lighting conditions this is much less of a problem. When dry, the color is waterproof, odorless, and does not rub off or transfer under any conditions that I have discovered. Both chairs were a bit ???crunchy??? right after application, but the crunch soon wears off without otherwise affecting the color. And the cat seems to love the painted chairs just as much as their drab predecessors. I?? ?ve only lived with the spray-painted chairs for a couple of weeks, now, so the long term wear-hardiness of the color remains to be proven. Also, a can of this stuff has to be used all at once. If you absolutely have to stop spraying in the middle of a can, reportedly, you can invert the can and blow it out and store it overnight with the nozzle submerged in water. But generally speaking, once you start spraying, you have to finish the can; even using the underwater trick, any paint left in an opened can will be useless in a couple of days. The stuff is kinda pricey at $12 for an 8-oz can, as of this writing. My orange chair took three cans to get complete coverage, while the more problematic blue color took four cans to get coverage that?? ?s still a bit thin here and there. With shipping, it came out to about $40 to paint the one chair orange, and about $55 to paint the other one blue. Given otherwise-satisfactory furniture, already on hand, the orange paint actually seems like not such a bad deal, to me, when compared to the time, energy, and expense that would be required to track down and procure equivalent upholstery in one?? ?s preferred color in the used market. And compared to buying new furniture, it?? ?s a steal. And while I can?? ?t say that I?? 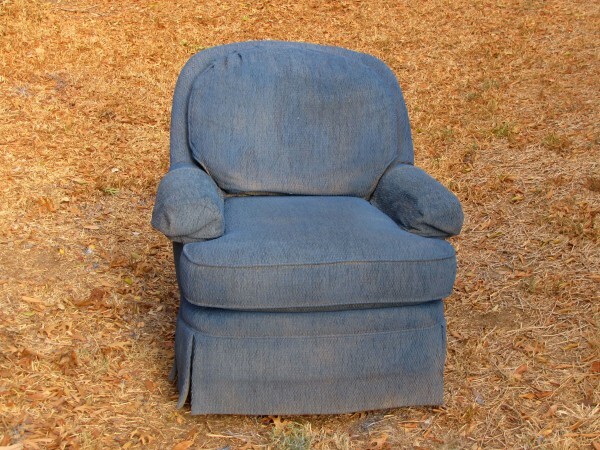 ?d unequivocally recommend this product to everyone with an off-color chair, sofa, or loveseat, it does work a heckuva lot better than I ever imagined it could, and it was actually a lot of fun to use. Under the right circumstances, it could be just what the doctor ordered.